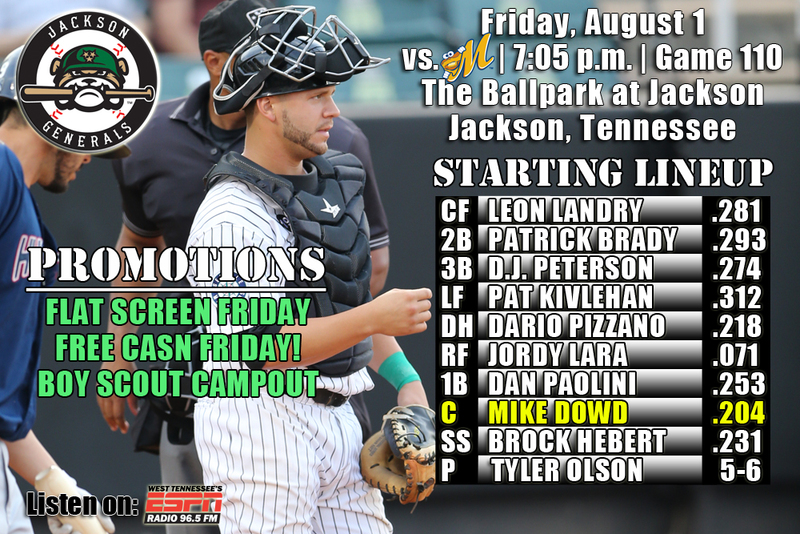 • On Friday, the Generals continue a 5-game series with Montgomery at The Ballpark at Jackson (0-1)…the Generals are 4-7 against the Biscuits this season and 2-4 in Jackson…the Generals have won 3 of the last 5 series and won 4 of 5 in last homestand vs. Huntsville…dropped 4 of 5 on recent road trip to Mobile. • The Generals scored a run in the first inning to jump out to an early 1-0 lead and 2B Patrick Brady hit a solo home run to lead off the 6th inning, but Jackson was thrashed by Montgomery 12-2 on Thursday night. Brady (1×3, R, HR, RBI), CF Leon Landry (1×4, R, 3B), SS Ketel Marte (1×3, RBI) and 1B D.J. Peterson (1×4) each recorded 1 of the team’s 4 hits. Starter Cam Hobson (3.0,7,8,8,3,3,HR) recorded his 9th loss, allowing 8 runs on 7 hits in 3.0 innings. RH Moises Hernandez (2.1,7,4,4,0,3,HR) allowed 4 runs in the 6th inning, while LH Kyle Hunter (1.2,1,0,0,0,1), RH Richard Vargas (1.0,1,0,0,0,2) and position player Brock Hebert (1.0,1,0,0,1,1) combined to hold the Biscuits scoreless over the final 3.2 innings in relief. • Despite dropping 5 of the final 6 games in the month of July, it was Jackson’s winningest month of the 2014 season. Jackson finished the month 14-14, batting .263 (3rd in SL), with 21 home runs (4th), and a 4.17 ERA (6th). • Sanchez finishes July strong – Starter Victor Sanchez was 2-0 with a 2.02 ERA (8 ER, 35.2 IP) in 6 starts in July. During the stretch he has limited opponents to a .198 (25×126) average, while walking 9 and striking out 28. • INF/OF Patrick Kivlehan currently ranks 5th in the Southern League in batting (.312) and 4th in slugging percentage (.513). Kivlehan also ranks 7th in the M’s organization in average (.302), T-4th in HR (17) and 2nd in RBI (88). Those numbers combined between Jackson and High Desert. • Bring on the Biscuits – The Generals are 4-7 this season against Montgomery and 2-4 in Jackson…the Generals are batting .272 with 7 home runs, 23 doubles, 5 triples and 56 runs scored in 11 games. • The Biscuits have a season-high .278 batting average, with 14 homers against Jackson this season in 11 games played…Luke Maile leads the way with offensive numbers .433/0/3 with Jeff Malm (.344/0/4) and Jake Hager (.333/0/5) right behind…Taylor Motter has 4 HR’s in 9 games against Jackson. • Wracking up the Triples – Last night Leon Landry collected his 6th triple of the season which was Jackson’s 40th as a team. Last season Jackson had 41 through the entire season. • Relieving Guaipe – RHP Mayckol Guaipe picked up his team-leading 8th save Monday and has a 2.42 ERA in 29 games this season, with 42 strikeouts… ranks 3rd among SL relievers having just walked 8 batters in 44.2 IP…he also ranks 2nd in fewest baserunners/9IP ratio at 8.26 (41/44.2 IP). • Landry is the 2nd-toughest in the league to strikeout – OF Leon Landry is 2nd in the Southern League in fewest strikeouts, fanning just once in every 9.02 at-bats. • Summer of Hitting – The Generals are leading the Southern League in batting since June 1st, batting .279 (495/1,775) with 31 home runs, 102 doubles and 25 triples in 53 games. • INF Patrick Kivlehan has hit safely in 13 of his last 15 games, batting .351 (20×57) with 9 runs scored, 6 doubles, 3 triples, 2 home runs, 13 RBI and 7 walks. He also has hit safely in 18 of his last 21 games, batting .364 (28×77) with 15 runs scored, 7 doubles, 4 triples, 3 home runs, 18 RBI and 9 walks.